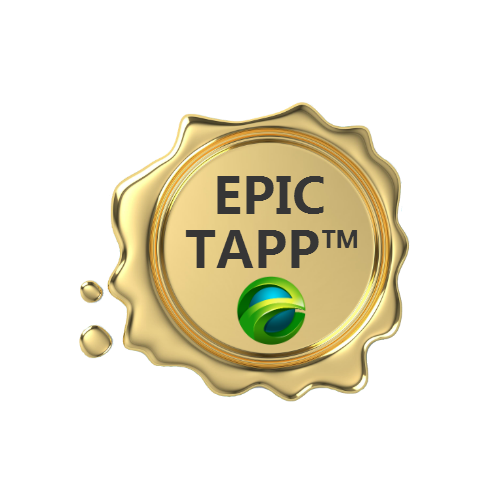 EPIC TAPP™(Total Assessment Personality Profile) Tool – EPIC Connections – Discover Your EPIC Code! The Best Gift you can give to another is the opportunity to discover their EPIC Code™. This enables them to better understand how our Personality Profiling VRB (Values Relationship Builder) affects the decisions they make, influences the potential success they have, and impacts their life overall. In order to give The Best Gift, you need our EPIC TAPP™ Tool. 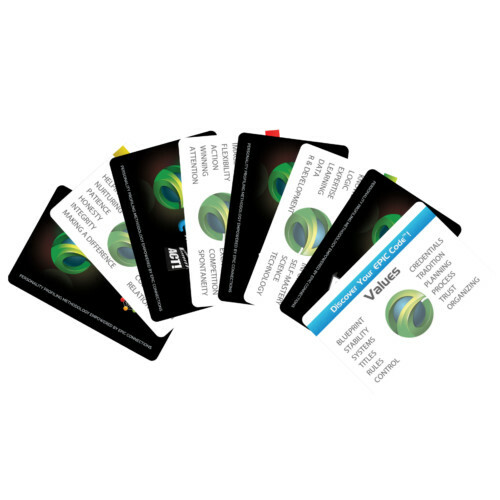 It enables you to secure a unique link that not only allows the person to discover their EPIC Code™, but also gives them a complimentary EPIC TAPP™ (Total Assessment Personality Profile), a $75 value, empowered by our VRB. Select one of our subscriptions below that best meets your needs. You will be able to give The Best Gift to anyone…any time, any day, every day! 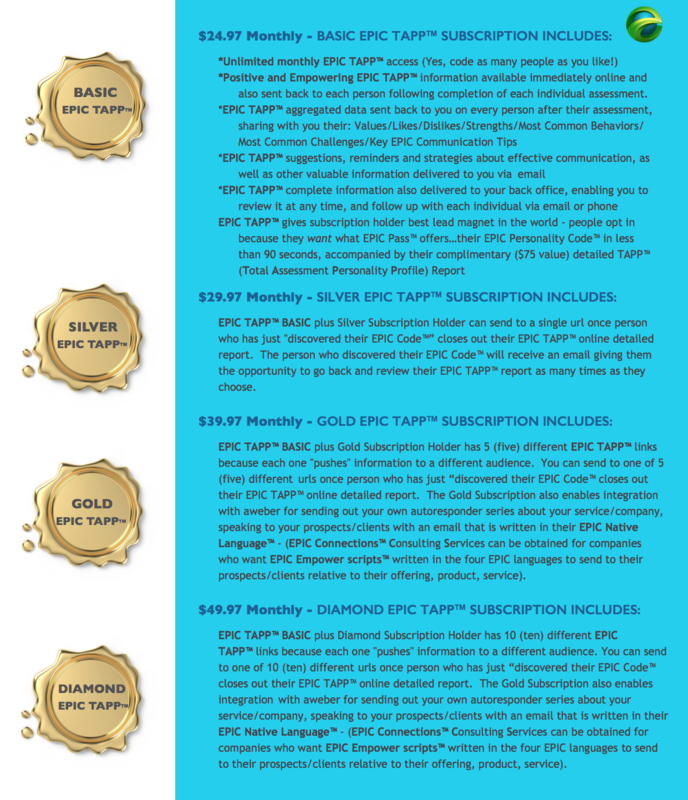 EPIC TAPP™ offers you premium access for sharing the EPIC Code™ Personality Profiling System with our VRB (Values Relationship Builder) to an unlimited number of people each month, enabling you to say to each one…“Discover Your EPIC Code™ and receive your complimentary, personalized EPIC TAPP™ (Total Assessment Personality Profile), a $75 value and a gift from me.” That’s the BEST GIFT you can give anyone…a better understanding of who they are. There are four subscription levels to accommodate your diverse needs. See the picture at the bottom of this page for descriptions of each, which are also contained in the drop down choices for ordering. If you are a large corporation, business, or group and need a large number for people in your organization, click here (link to contact page) to contact us for a special quote. We can also can do a custom API integration for you to have it inside your website if needed. You tell us what you need, and we will do everything to make it happen! Let’s face it, if you’re alive, you’re presenting…to somebody at some point…whether that is to a spouse, a client, a colleague, a friend, a prospect, or a family member. You have to “sell” your ideas, concept, product, or services. You have to get their “buy in” on what you are presenting. Most people attempt to do this from their point of view and foundation of understanding, and in the manner in which they like to receive information. Unfortunately, because the other person’s EPIC Code™ is potentially different from yours, you aren’t being heard most of the time. And neither are they. How would you like to change that scenario? Values/Likes/Dislikes/Strengths/Most Common Behaviors/Most Common Challenges/How They Relate with other codes/What Motivates Them. 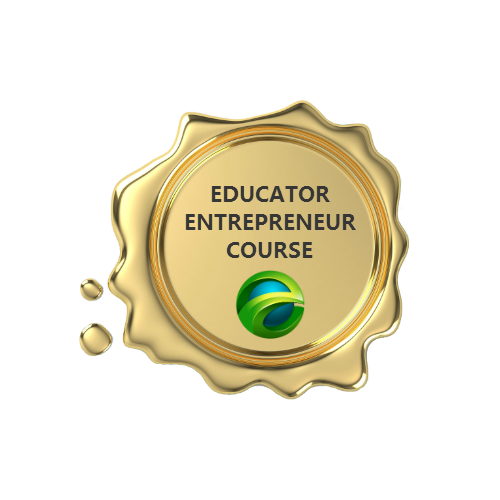 Imagine the gratitude of prospects, clients, business colleagues, friends, family members, or your spouse when they have the opportunity to discover their EPIC Code™ just like you did. Perhaps one of the subscription levels below will resonate with you.